This article outlines the luxury hotels in Kuala Lumpur which offer Club or Executive Lounges to guests. 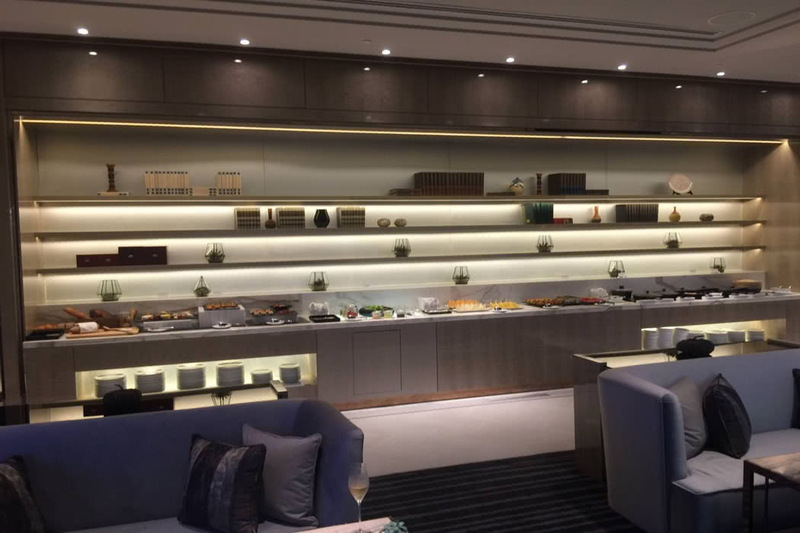 By reviewing each of these Club Lounges, I conclude which hotel Executive Lounge comes in at the top and which hotels I would select as having the best Club Lounges in Kuala Lumpur. Remember, if you are planning to book a business class flight or a luxury hotel, contact our luxury travel concierge for free upgrades, free breakfasts, deals and special benefits. We may even be able to offer you free Club Lounge access at your chosen hotel. Why Choose A Hotel With A Club Lounge? 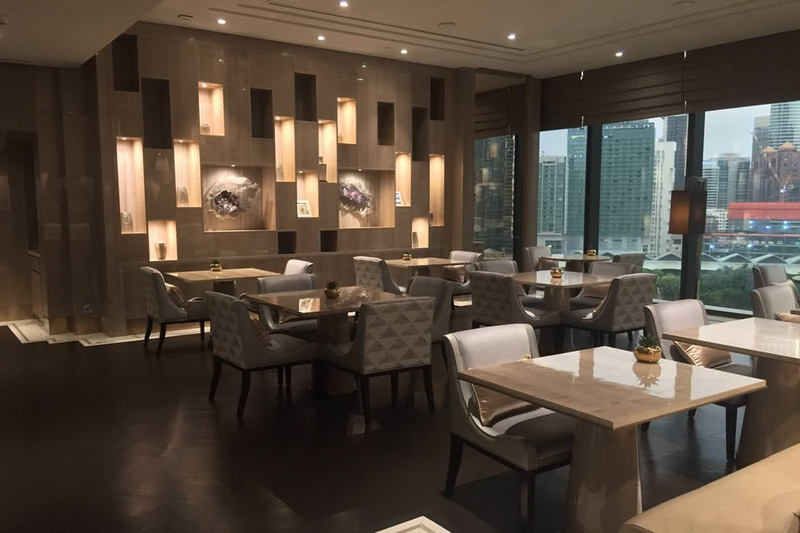 When deciding which hotel to choose for your stay in a city like Kuala Lumpur, it is sensible to consider the added extras provided by a hotel Club Lounge or Club Room. Offerings usually include complimentary drinks and snacks throughout the day, breakfast in the morning and evening cocktails with canapés. Often the evening food and drink offering is more than enough to replace the need to go out for the evening. Executive or Club hotel lounges provide an interesting environment to work and relax in. Some lounges also provide dedicated meeting rooms, although I find holding meetings in the main lounge more friendly. When I travel on my own for business, I don’t like to sit in restaurants on my own. Room service is also a lonely affair, so a Club Lounge provides the ideal environment to enjoy good food and atmosphere whilst being completely comfortable that you are sitting on a table for one. Many travellers find that Club Lounge supplement is good value. You can eat drink and live within the best versions of these lounges along with conducting meetings if you are there on business. In fact, many business travellers justify the inclusion of a Club Lounge in their expense rate as they will not be claiming any other expenses during their trip away. Club Lounges can also inspire business travellers, or in my case, they help to inspire me to write. Rather than becoming a hotel-room recluse, a Club Lounge enables lone travellers to socialise in luxury, even if that socialising is just watching people passing by. The diversions and entertainment offered by a Club Lounge definitely aid work and fend off boredom, surely that makes them worth the price of admission alone? If you travel with children, Club Lounges offer an escape from the bedroom where there is usually enough space for your little ones to play without annoying anyone. Just make sure that the Club Lounge that you choose in Kuala Lumpur accepts kids as many don’t. Which Hotels Have The Best Executive Club Lounges In Kuala Lumpur? I have compiled a list below containing the Club Lounges available across luxury hotels in Kuala Lumpur. I list the ones I consider to be the best at the top. During my wonderful stay at the Four Seasons Kuala Lumpur, I had access to their Executive Lounge on the 7th floor. The huge lounge took up the whole floor and featured various seating arrangements from dining tables to living room style lounges. There was also an outdoor patio which overlooked the city skyline (pictured above). The lounge served three meals a day; breakfast, afternoon tea, and evening cocktails, and featured a generous and aesthetically beautiful spread with everything from hot food to pastries. 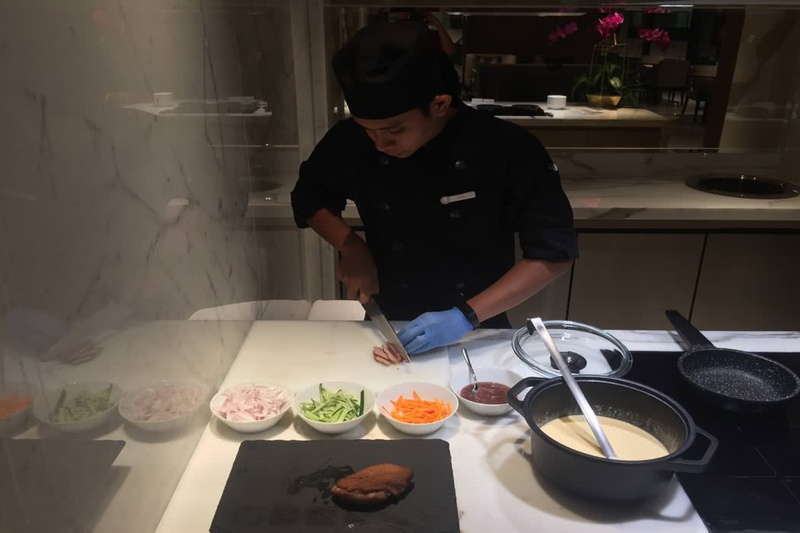 There was also a chef manning a live cooking counter to freshly prepare a few hot dishes (again see pictures on the scroller above), plus. I was very impressed by the Pol Rogers champagne served in the lounge! In conclusion, the extensive spread of food and fine drinks was more than enough to keep you full and watered throughout your stay. The quality and flavours were was impressive. I loved the outside space in the lounge and I also love the hotel’s super cool rooftop pool. 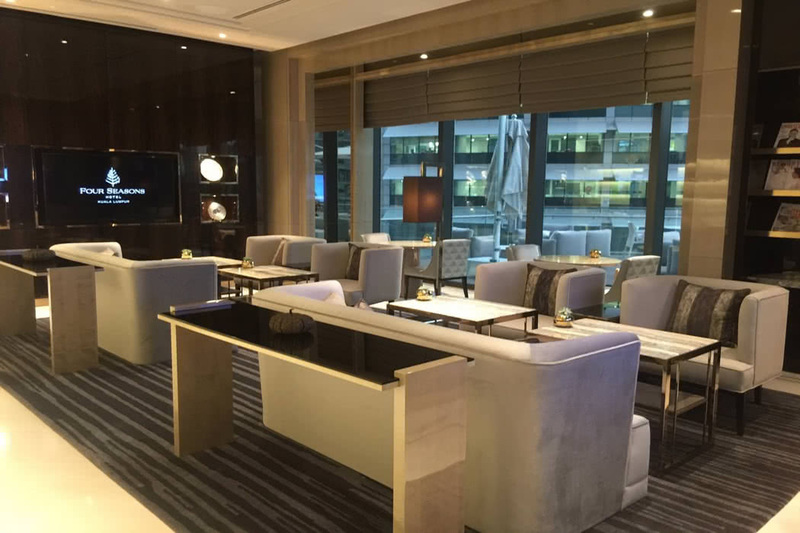 The Four Seasons Kuala Lumpur Executive Lounge is definitely my top choice for Club Lounges in Kuala Lumpur and comes in in my number 1 spot. Book a Club Room at the Mandarin Oriental Kuala Lumpur and you can access this cosy Club Lounge. 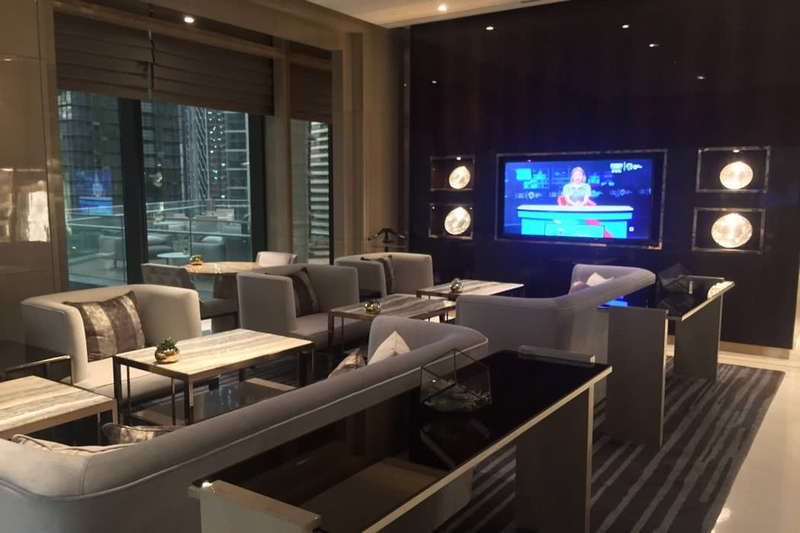 In our opinion, this is the second best Club Lounge in Kuala Lumpur and it is super swish. Take a look at the photos on the Mandarin Oriental website for a full tour. With floor-to-ceiling windows, wood-panelled walls and marble floors, this luxurious Mandarin Oriental Club lounge offers an exclusive environment in the heart of the city. This Club Lounge includes breakfast in the morning, a weekday lunch, a delicious afternoon tea and evening cocktails. You also get use of Club Floor boardroom for two hours per day and the very useful benefit of five pieces of dry cleaning per day. Unusually, if you have a child under the age of 12 years you cannot use this lounge, as they will not be given access. When my son was little, we found Club Lounges a hugely useful space when we wanted to get out of our hotel room. Club lounges offer an informal and spacious area which is usually child-friendly (subject to your child behaving!) so it is a real shame that this Club Lounge excludes young children. If you have kids you should opt for the Four Seasons lounge above. Four Seasons hotels are always ultra child-friendly. Another excellent Club lounge can be found at the Ritz Carlton Kuala Lumpur. This one is situated on the ground floor, and access to this Club Lounge comes free with Club Rooms. You get breakfast, afternoon tea, evening cocktails and snacks. The problem with this club lounge is that there is no view here, unlike the lounge at the Four Seasons, for example, that has a wonderful cityscape to look down upon. This lounge is found on the ground floor next to the Club entrance and has a stylish look and calm ambience. Those staying in the Shangri-La’s premium rooms immediately gain entry to the Shangri la Club Lounge in Kuala Lumpur which is called the Horizon Club. It offers lavish spreads of food laid on several times a day, work stations, boardrooms, reading rooms and smoking rooms. Other guests can pay a supplement to gain access to the club and in our humble opinion, it is worth paying the extra for access to this Club Lounge. After a million-dollar “re-imaging”, the Horizon Club looks like an elegant, exclusive living room. It has a similar feel to the famously chilled Buddha Bar in Paris’s 8th arrondissement, with white marble floors and ebony walls, plum velvet lounges and cream padded chairs, quartzite bars and plasma screens. Every evening hosts a cocktail hour in this club lounge, where you can enjoy mini quiches, European cheeses, sushi and salads along with a large variety of spirits, wines and alcoholic as well as alcohol-free cocktails. Of course, the Shangri La has other advantages like an outdoor pool surrounded by tropical vegetation, but it does not offer the very best Club Lounge in Kuala Lumpur (sorry!). With a loyal following, the Traders Club Lounge seems to attract repeat guests. The hotel itself is well located, opposite the Petronis Towers & shopping centre and a short walk to Pavillion and around a $4 taxi ride to Starhill Plaza and other central attractions. Club rooms have a private check-in and are beautifully appointed and we recommend that you book a Twin Towers view room. City View Club Rooms are identical but with no view. The Club Floor offers a hot and cold buffet breakfast, cooked eggs, fresh juices and so forth. Afternoon tea is served from 2.30 – 4.30 each day offering hot and cold savoury items including sandwiches, scones jam and cream and delicious cakes. Drinks are free up to 11 at night. Cocktail hour is 5-7pm when you can pick between wine, spirits and beer. There are plenty of drinks and staff provide a reminder 10 minutes before the end of the cocktail hour so you can stock up! There is also a Hot and cold food buffet with a cheese platter and fruit. Enough food is provided to satisfy your appetite as a full evening meal. The hotel also has a gym, pool, restaurants and bars and a nice addition is a complimentary buggy service which runs to the Petronis Towers which is ideal for the hot climate of Kuala Lumpur. Recently renovated, this Club Lounge offers competent staff and a stylish environment. It features a beautiful live kitchen, a private meeting room, shower and changing rooms (ideal for late night flights out of Kuala Lumpur as it is 6:30 AM to 11:30 PM daily) as well as a comfortable lounge. The double-height ceiling makes it feel spacious. There is a private check-in and check-out experience as well as all-day refreshments here at the lounge. Generous evening cocktails run from 6:00 PM to 8:30 PM with a wide selection of beverages and food more than enough for a full dinner. 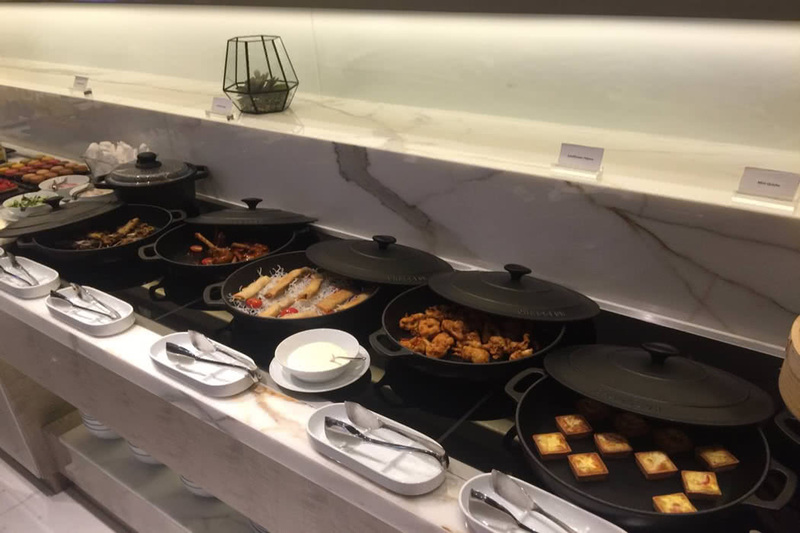 Guest with Le Meridien Club Lounge access has the option of having a full buffet breakfast at the main restaurant downstairs or a private (but smaller selection) breakfast in the Club Lounge. The advantage of eating in the lounge is the more sophisticated environment and the lack of queues. This hotel is better located and maintained than Renaissance Kuala Lumpur Hotel detailed below. The Executive Club Lounge is excellent with wonderful views, generous food and servings in the lounge. A disadvantage of this lounge is that children under 12 are not allowed in! 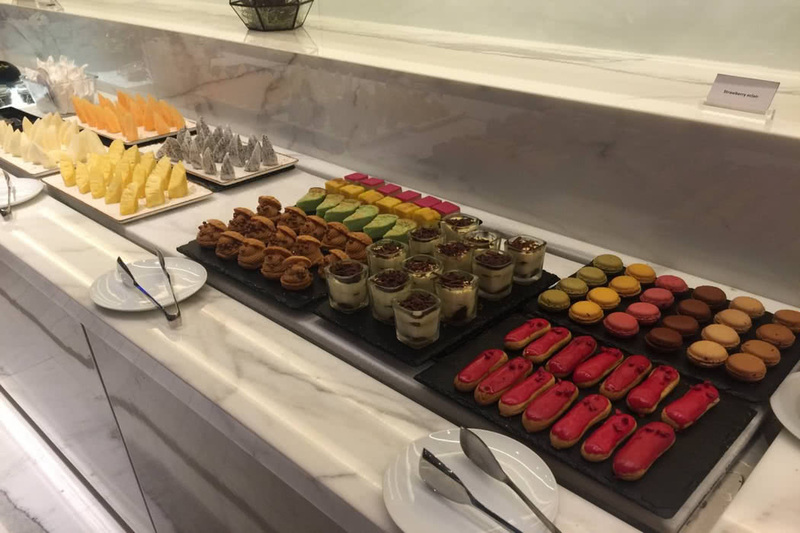 For a more family-friendly Club Lounge try the Four Seasons, or if your budget doesn’t stretch that far, the Renaissance Kuala Lumpur offers a much cheaper alternative and is reviewed below. Hilton Executive Lounge in Kuala Lumpur has an excellent reputation with a high-quality food and drink selection for both breakfast and evening snacks. The lounge extends to both sides of the hotel with big panoramic windows and a spectacular view. The Petronas towers are about the only thing you can’t see. In fact, Hiltons often have some of the most generous food offerings of a major brand. The downside is, of course, that Hilton is a major brand and not a prestigious luxury brand like the Four Seasons, so it’s lounge, while nice, will never make it to the top of our list. Book an executive room at the Westin Kuala Lumpur and you get access to their Club Lounge. Westin Executive Club Rooms are located between Level 31-35. The rooms are spacious (452 sq ft/42 sqm) and well-appointed with contemporary decor. Their exclusive Club Lounge located on Level 3 and is open daily from 6 am and 11 pm. It is elegant if a little classic and old-fashioned in decor. Guests can have American hot breakfast, afternoon high tea, complimentary non-alcoholic beverages and snacks as refreshments throughout the day as well as unwind in the evenings here with a selection of hors-d’oeuvres, spirits and wines. This hotel also has a particularly good kids club. The Park Royal Kuala Lumpur is conveniently located in the heart of shopping paradise for the daytime and in the heart of the entertainment district of Bukit Bintang for night time fun. Club rooms offer private check-in via the orchid club room. The rooms looked modern, well equipped and spacious. With a club room, you are entitled to breakfast at the orchid club room, or at the restaurant downstairs. It is more convenient and less stressful to have breakfast in the orchid club room, but the breakfast downstairs has more variety. Club lounge facilities also include evening drinks and canapes along with the caring staff. Book a Club Room at the Renaissance Kuala Lumpur and you get a very large room complete with excellent views. Club rooms include access to the newly renovated club lounge on the 35th floor. The new look incorporates a unique design and exciting spaces. Divided into five zones which are The Lounge, The Dining Room, The Loft and The Studio with an adjacent meeting room, each offers a versatile space to use. On offer for free is breakfast and free evening cocktails between 5.30-7.30pm (along with a nice snack buffet and other free alcoholic drinks) and free soft drinks throughout the day. This hotel also has a swimming pool, gym, sauna and steam rooms and most major sites are within walking distance, though 2 LRT stations are close by and can whisk you to places like Bukit Bintang in minutes for an authentic evening meal from the street hawkers in minutes. 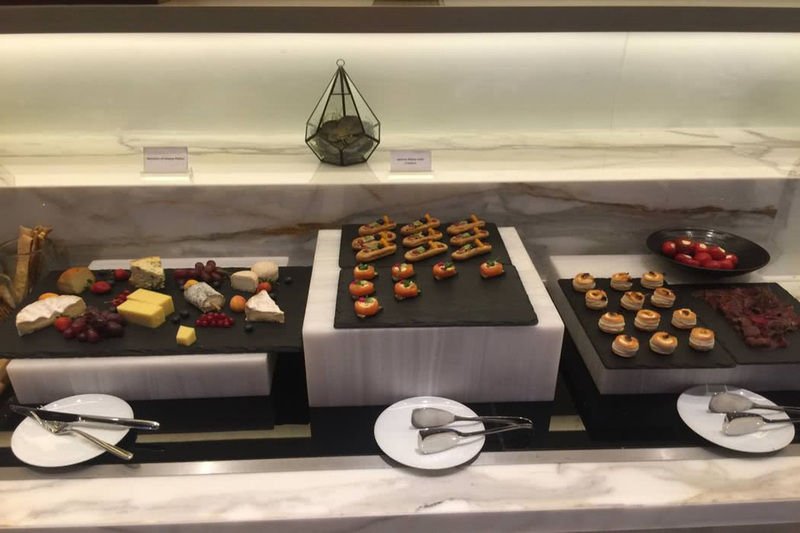 Hilton Executive Lounge in Kuala Lumpur has an excellent reputation with a high-quality food and drink selection for both breakfast and evening snacks. It is located on floor 33 and there’s a small terrace top floor lounge with wonderful views of the Petronas Twin Towers at sunset. The Melia has a club lounge called The Level offering an excellent selection of drinks, hot and cold hors-d’oeuvres. Fabulous staff and a great location just across from Imbi monorail and Times Square. This is not the best Club Lounge. Staff have the reputation of being unenthusiastic and decor is rather basic, certainly not what you would consider luxurious. The executive lounge food is passable, but the drinks selection is poor, with only one white wine, beer and a few basic spirits and no cocktails. I am including this lounge at the bottom of my list. This is not a great Crown Plaza and although the Club Lounge has quite recently been refurbished, it does not have a great reputation, with ugly mismatched furniture and “cheap and nasty” food and wine.